← Happy independence from the United Kingdom day. 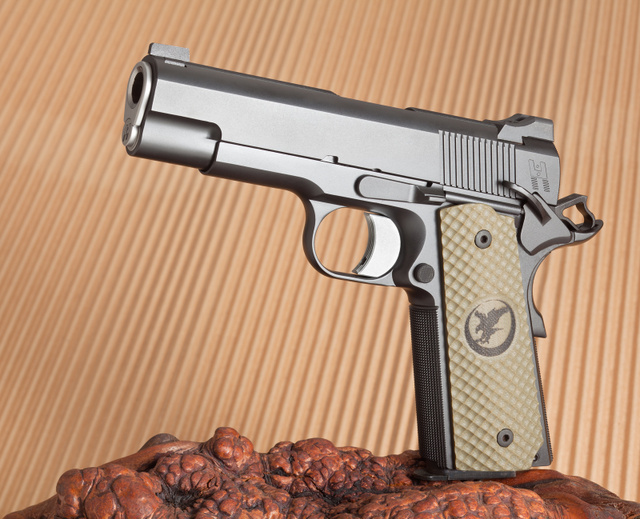 Nighthawk Heinie .45 — curiously, it doesn’t seem to be a cataloged model. 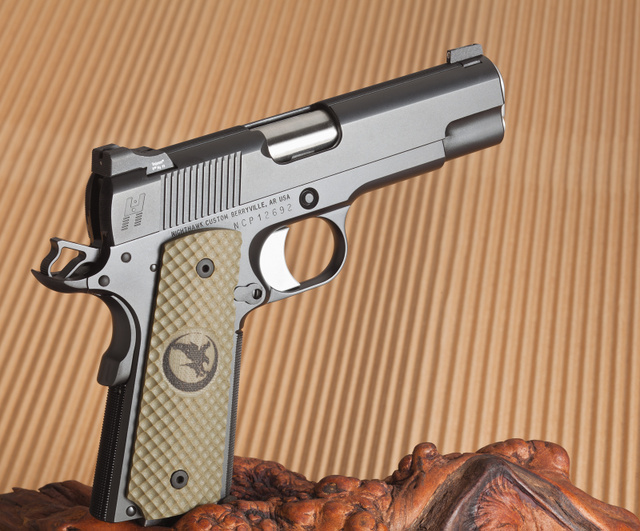 Grips are this gun’s one departure from decorative: they are designed for use with shooting gloves. 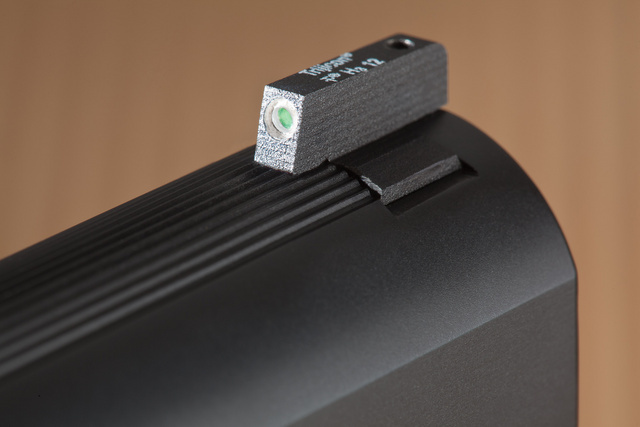 For carry or showing off, smoother grips would make sense. 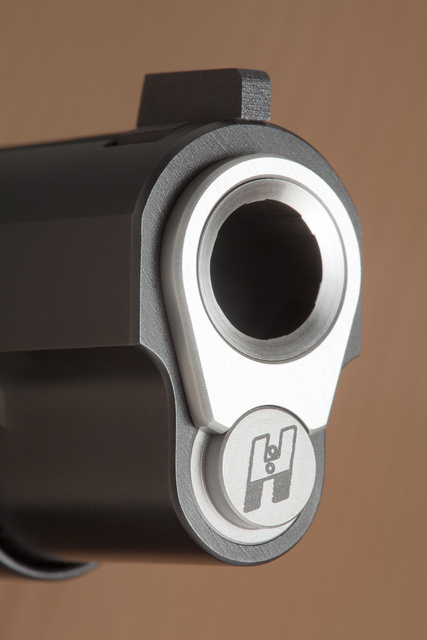 Crimson Trace carbon fiber pattern option comes to mind, but they seem to be out of stock. Maybe use chain mail finish instead? 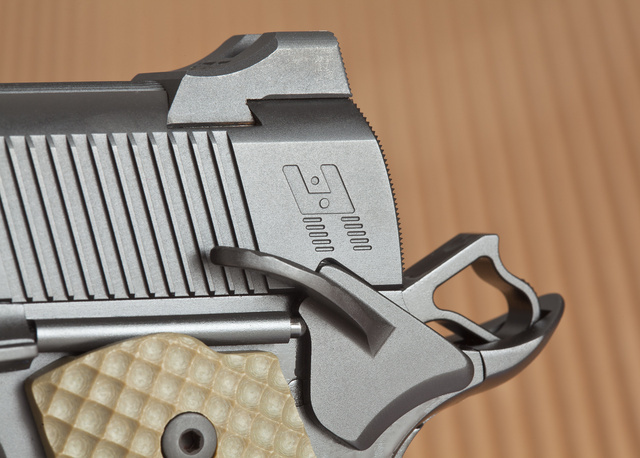 An appropriate holster like this Sideguard would also be in order. 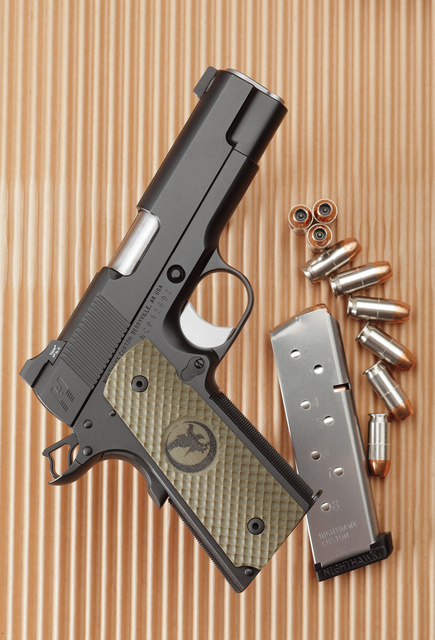 This is not my pistol, it was provided as a photo prop by Guns4Pennies. Photos of my own Nighthawk Predator are coming soon. 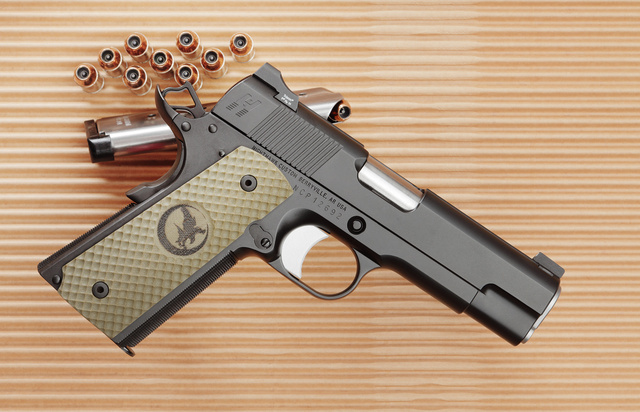 This entry was posted in holster, pistol and tagged 1911, 45ACP, blued. Bookmark the permalink. I’m pretty much a _caveat emptor_ kind of guy, but your mention of Guns4Pennies got me a little riled. These “penny auction” sites are _not_ auctions at all. They’re gambling, plain and simple. They’re almost exactly the same as a raffle. These sites can make tremendous amounts of money from “auctioning” even very expensive items far below their market value. This is because EVERY $0.01 “bid” costs the bidder $1 or whatever, whether that bidder wins or not. I hope everybody who’s a fan of Oleg has sense enough to look into something that definitely seems too good to be true. Because in this case as usual, it is. I understand that work is work, but I’d think twice about condoning this kind of deceptive scheme. We live in the information age. This information should be spread far and wide. I think GuntDoc is right, the process resembles poker more than a regular auction. Since the details are explained up front and new users are given free bids for experimenting, I don’t really see a problem with it. 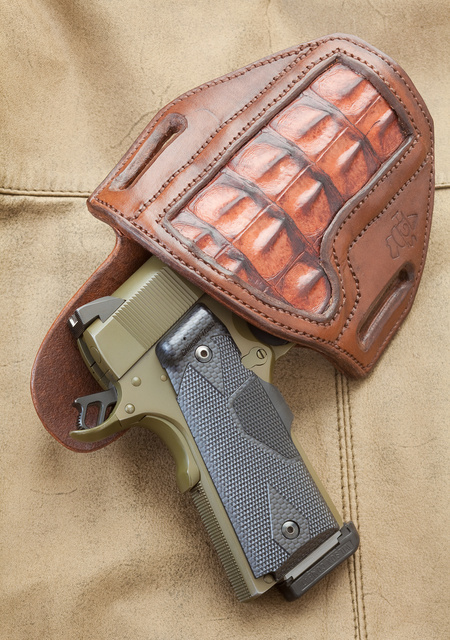 The grips aren’t for use with shooting gloves, they’re for use when your hands are wet with sweat or blood or other fluids, down in the gutter or on the ground, when your life is at stake. They’re not great for shooting classes to fire hundreds of rounds, and they’re not good for showing off or being a gunstore commando. They’re for fighting. 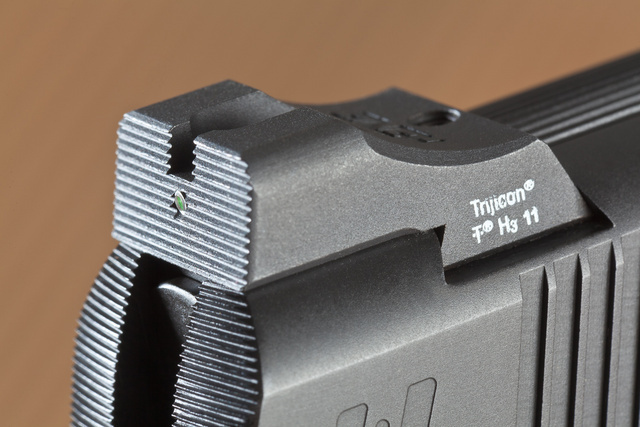 Amazing looking firearm, the radiused edges and fine finish really show the care that went into the design and production. 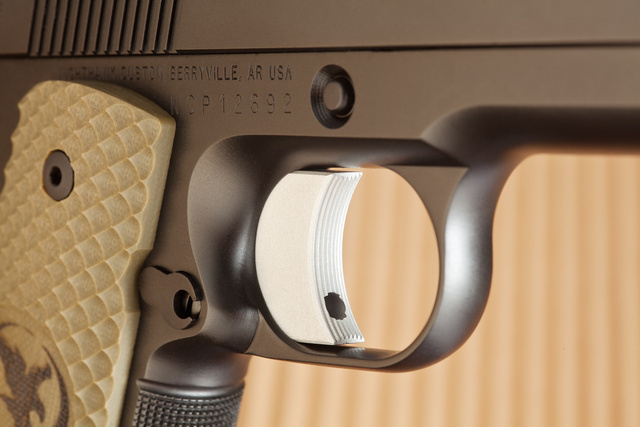 The grips do look aggressive, but as Charles pointed out, they seem to be a real world functional choice. Rick, what’s wrong with a business making money? If everyone involved knows the process, and if they’re buying the bids it can’t exactly be a mystery to them, then what is the problem? Since they’re buying guns, they are presumably adults and can make their own decisions about how to spend their money. Besides, the success of Vegas and countless small poker nights among friends shows that many people like gambling. There’s nothing about that gun that’s “decorative”. The suspension on a Formula 1 car is an exquisite piece of machinery, but it isn’t “decorative”; beautifully executed craftsmanship is not “decorative”. That’s an ugly, matte black gun meant to get the snot whaled out of it. Like a Glock, just a lot more expensive.